Today was our adventure to a "new" slot canyon, Canyon X. 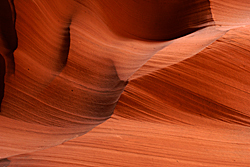 Only one tour group has access to Canyon X, and they take a maximum of 6 photographers in per day. We had heard that Antelope Canyon is now a nightmare with all the tours going through, so we were looking for something different. 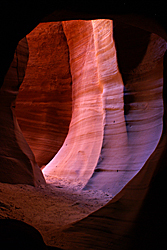 Although the trip was a little pricey, the 5-hour trip provided access to a slot canyon we hadn't shot before. Jackson, a 78-year old "escapee from California" was our guide. He drove us in his Jeep to the ridge overlooking the slot. We had to climb down a 75 foot drop to get into the canyon. It required care, but wasn't a major obstacle. Once inside the canyon, the 3 of us split up to shoot in different areas. 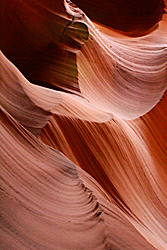 Like Antelope, it was all about finding areas that glowed from reflected light or that had interesting textures. 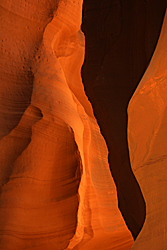 Canyon X didn't have nearly the color intensity of Antelope, and it didn't have any light shafts. Still, it was an interesting place to shoot for a morning, and Jackson was pretty entertaining. The hike up that 75 foot section was much more of a challenge than coming down for Carol. By the time she reached the top, she was wiped out. But she did much better than Sybil, the third person on the trip. Walking on a trail seemed to be a substantial challenge for Sybil. Too much heavy gear and not enough coordination. We had originally planned to drive to Bryce after we returned from Canyon X, but it was 2:30 by the time we got back. We decided to stay at Wahweap one more night and then drive to Bryce. We starting talking to our camping neighbors, John and Marge as we watched the moon rise and discovered they were also leaving for Bryce the next day. They were also planning to camp at Ruby's Inn to take advantage of the full hookups. We started talking about things to see in the area, and John invited us in to their trailer to see the book they were using to plan their trip. They have a huge 5th wheel trailer that is beautiful. It has 3 slides and the bedroom is a step-up from the living room. John & Marge are from Houston and are Rockets fans, so they have been watching the playoffs. We certainly meet some nice people on these trips.